I have been thinking a lot lately about light. Like our cat, I find the light shining in through the windows and lounge there, to feel the warmth on my body. I imagine myself being outside when it's above these freezing temperatures we’re having, and being enveloped by the sun, feeling warm pavement. I want to go there and be there and dance around in that like Maria in the Sound Of Music (minus the terrible dress and being a nun). In thinking about everyone being stuck inside because of the cold temps lately, and I imagine we're probably trolling the internet much more. At least I am on Pinterest a heck of a lot more than usual. Things just slow down in the cold. 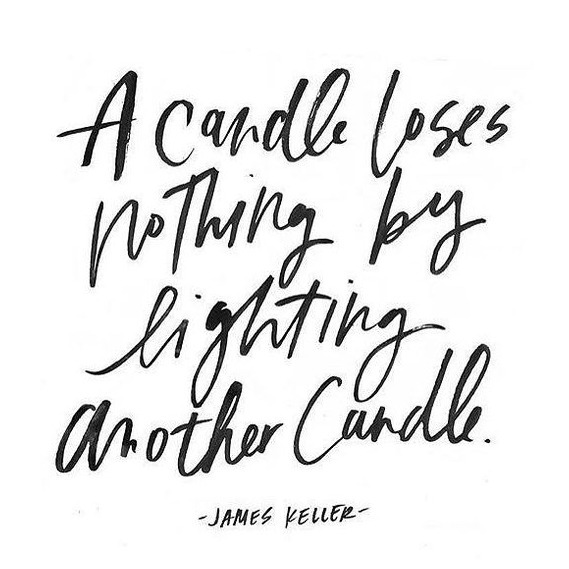 I always come across this quote on Pinterest, “A candle never loses its light by lighting another candle.” It hits me every time I read that and lights up areas in my heart that have become hardened. It’s a constant reminder to me to encourage others and make lives brighter. Turns out, according to the Bible, you're sheep. I see this behavior, even among supposed Christian women, and I find it ridiculously hilarious. I remember walking into a grocery store years and years ago with two small children. I probably looked like a normal whoever. But I had just lost my grandmother and my life was in turmoil and when the sliding doors opened and I saw all the people, I wondered if they could tell my life felt like it was falling apart. ‘If I can just buy a couple of groceries without crying...’ I thought to myself. Did I need someone to ask me if I needed paper or plastic? No. I sure didn't. Because it. Doesn't. Matter. What I needed in that moment was someone to push my cart out for me and say, God is with you, or you're doing a good job with your kids, or here’s $5, go to Starbucks over there and get you a cake pop. Heck, a sincere smile would be enough. Truth is, that we're all trudging through this life doing the best we can, and we could do a better job at rallying around one another and lighting other candles that have been extinguished by hardship and suffering. We don't have to be stingy with our flames because, at the very base of your knowledge, you can rest knowing that you're not the judge. God is. You're not the sheriff. You're not the big deal on the internet. You are, however, dearly loved by God who cherishes you and gave you specific gifts, some different from others’. He made you to love those difficult to love and not lord over them with all your harsh opinions. Opinions! Say it again, ohhhh pinnnn yunnns. Love is the command, people. Extending warmth, love in comments with kind words and likes and @'s and responses. They are the small yet bright sunny windows in the harsh winter we live in. They are light to those around them. These small gestures envelope people in love. And as it turns out, God is love. And the Bible says that I might have so much faith that I could move mountains, but I am nothing if I do not have love.